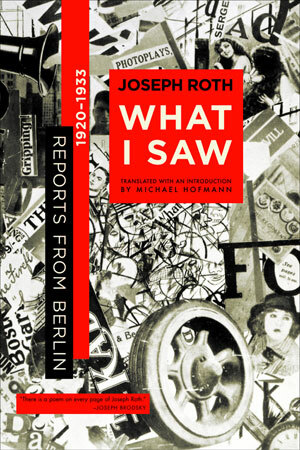 The Joseph Roth revival has finally gone mainstream with the thunderous reception for What I Saw, a book that has become a classic with five hardcover printings. Glowingly reviewed, What I Saw introduces a new generation to the genius of this tortured author with its "nonstop brilliance, irresistible charm and continuing relevance" (Jeffrey Eugenides, New York Times Book Review). As if anticipating Christopher Isherwood, the book re-creates the tragicomic world of 1920s Berlin as seen by its greatest journalistic eyewitness. In 1920, Joseph Roth, the most renowned German correspondent of his age, arrived in Berlin, the capital of the Weimar Republic. He produced a series of impressionistic and political essays that influenced an entire generation of writers, including Thomas Mann and the young Christopher Isherwood. Translated and collected here for the first time, these pieces record the violent social and political paroxysms that constantly threatened to undo the fragile democracy that was the Weimar Republic. Roth, like no other German writer of his time, ventured beyond Berlin's official veneer to the heart of the city, chronicling the lives of its forgotten inhabitants: the war cripples, the Jewish immigrants from the Pale, the criminals, the bathhouse denizens, and the nameless dead who filled the morgues. Warning early on of the dangers posed by the Nazis, Roth evoked a landscape of moral bankruptcy and debauched beauty—a memorable portrait of a city and a time of commingled hope and chaos. What I Saw, like no other existing work, records the violent social and political paroxysms that compromised and ultimately destroyed the precarious democracy that was the Weimar Republic.